Last Monday, at about 10:30 at night, I went to take out some trash to the apartment dumpster. As I stepped outside, I was quickly engulfed in a thick fog. The fog would definitely qualify for being high on the pea-soup scale. It was probably the thickest fog that I had seen in awhile. So I hurried to the dumpster and then went back to my place and grabbed the camera. It was kinda late, especially since I had to work the next day. But I thought that the fog might make for some interesting pictures. I got in the car and started driving to the Big Dam Bridge. 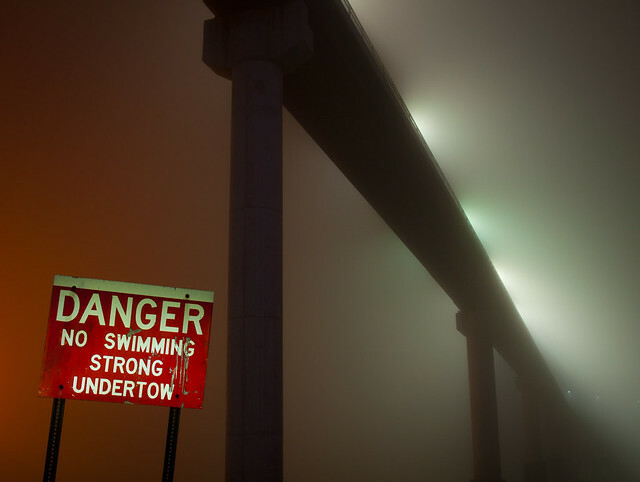 It was eerie - the fog was so thick that I could barely see 15 feet in front of me. I go to the bridge and set up the camera for a few pictures. 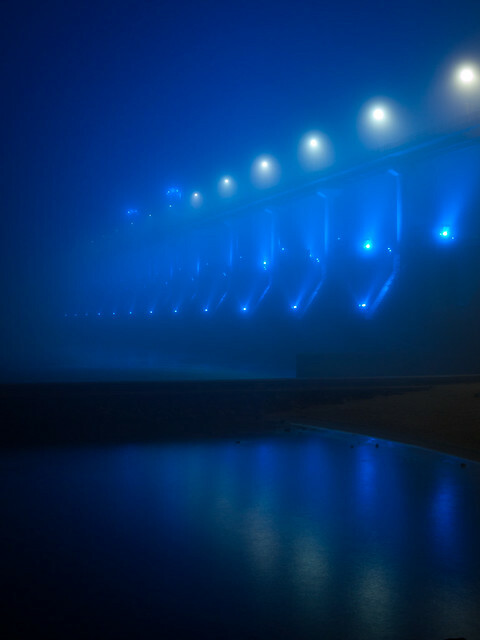 The lights on the bridge shuffled through several color schemes. 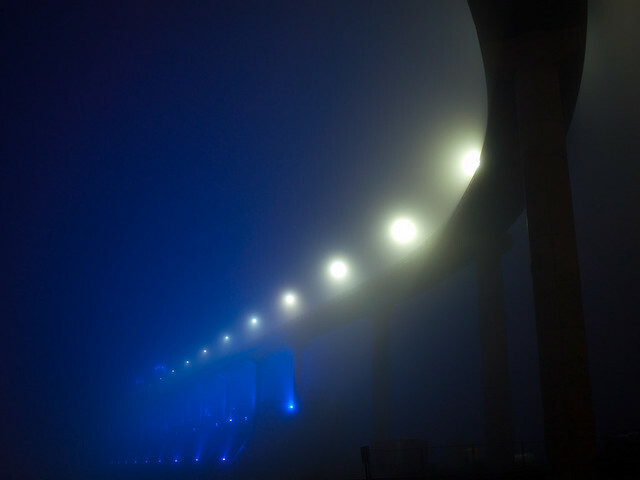 For some reason, the blue lights seemed to reflect off of the fog more than any other color. I was out there for about an hour, mostly because the anticipation of the alarm clock going off at 6:40 the next morning was not a pleasant thought. And also, it was about 34 degrees outside, which cast a bit of a chill. Not surprisingly, there wasn't anyone else out at the bridge. Usually, you can hear cars or people talking on the bridge. 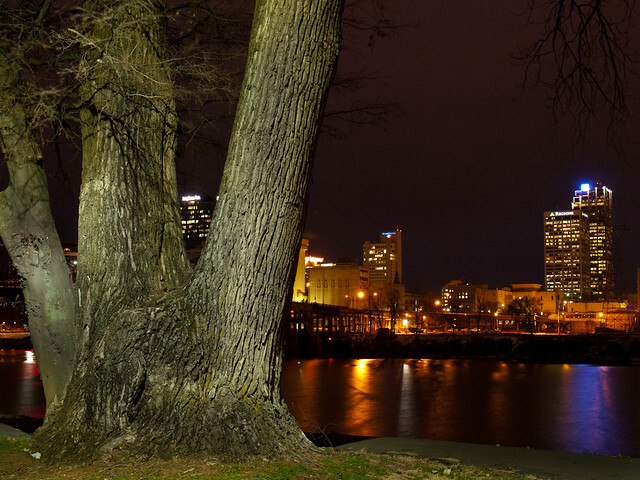 But it was silent, with the only noise being the hushed sound of the river, the buzz of the streetlights, and the distant rumble of traffic on the I-430 bridge. This may come as a shock to the three loyal people who read this - but when I was a young lad in college, I would partake in an occasional alcoholic beverage. My venue of higher learning was, unfortunately, located in a dry county. So to go and purchase our 6-pack of the devil's brew, we would have to travel to one of the nearby wet counties. Luckily for us, one was located just about 10 miles away in the town of Scranton, located just across the river from our stodgy dry county. 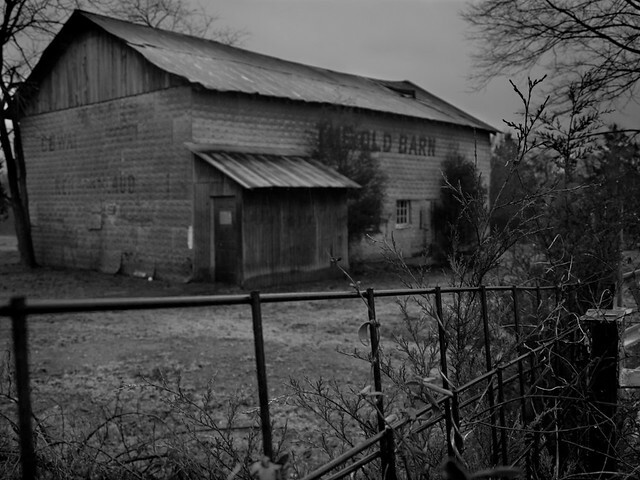 Just outside of Scranton you will see this old barn along the side of the road. 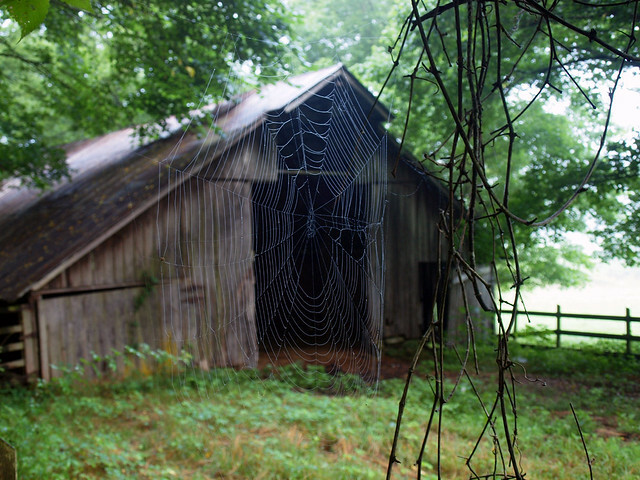 As a fan of old barns, it's always nice to see an old barn that is easy to get a few pictures of. And also, one that even labels itself as an old barn. Recently, I've been looking at a lot of old photos of downtown Little Rock. It is amazing to see the changes that have taken hold in this small city over the past century. Scores of old buildings have been constructed and then torn down, entire blocks changed and then changed again. Our collection of skyscrapers have grown, but for the most part, a good deal of the old buildings in the fair city of Little Rock have been torn down and replaced with sprawling parking lots. One old building that has survived is the Centre Place Building, along Center Street. 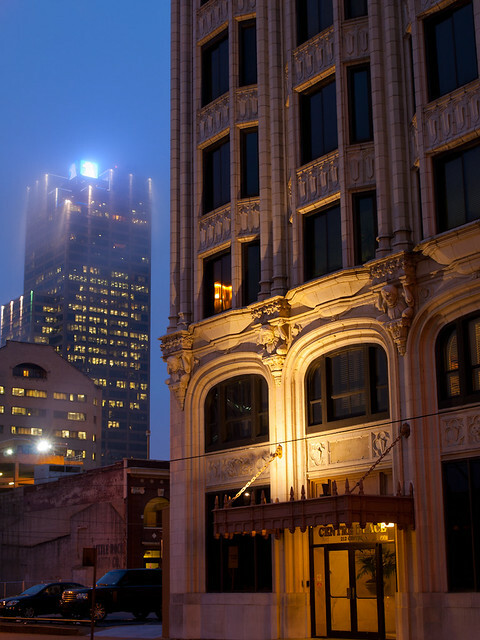 It was built in 1917, then called the Union Life Building. The narrow architecture of the building makes it somewhat unique, there really isn't any other building in downtown quite like it. It also stands out because it sits amidst a sea of parking lots, most of the buildings around it have long been torn down. More nearby buildings are being torn down now, just as this post is being written. Two buildings, along Third Street, have already had their final reckoning with the wrecking ball, or are in the process of slowly being demolished. The result of this will be, what? You guessed it, more parking lots. This is all a bit frustrating. I guess parking might be a problem in downtown - I don't really know since my office I work at is in the suburbs. But while a few new buildings have been built or renovated downtown, it seems like we are losing more buildings than we are replacing. It might be the bad economy, but still. It's a shame to lose any part of the city's character, especially to replace it with yet another parking lot. It just takes the heart out of what should be the city center. The worst is the empty lot that now sits along Main Street. An entire block was cleared, and still just sits as a gravel void that is surrounded by a fence. There is a vague promise that it will someday be turned into a new office building, but nothing has been said of when that might actually happen. Instead, we have this depressing hole, sitting along what was once the main street through the city. If a new office building is to be constructed there, it will probably be a few years before that happens. Until then, what will become of that spot? Will it sit fenced off and empty for the conceivable future? Now my knowledge of city planning and construction is based only on having played SimCity - but you'd think that there could be something worthwhile placed there in the short-term. How about turning that empty lot into a small plaza? Or lay down some sod and make it into a nice little park. At least have it be something. Or perhaps, just go all out and put up something like the Dublin Spire there - something much more unique and imaginative than just another empty lot. I took a day off from work on Friday, so I spoiled myself by having a good sleep-in. But I finally decided to actually do something productive with my free time, and decided to take the camera out for some pictures. I didn't really know where to go or what to shoot, so I just aimlessly drove around some. 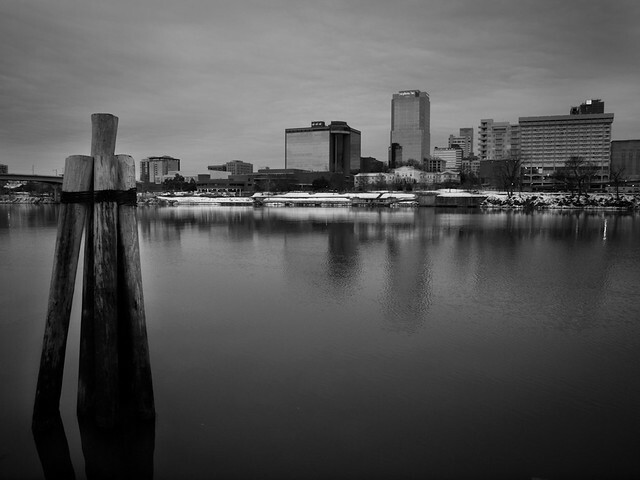 My wandering finally brought me to downtown Little Rock, but I had zero inspiration for any new sights to capture with the camera. I almost gave up and drove back home, not finding anything worthwhile in the gloomy overcast light. But to drive home then would mean joining the throng of commuters. So I ended up stopping at Riverfront Park in North Little Rock, trying to find a new spot to get a view of the downtown skyline. I passed by this spot, with these strange posts in the water. I guess they were used to dock boats at one point? This is looking up river, with the Broadway Bridge standing above the distant Baring Cross Bridge. 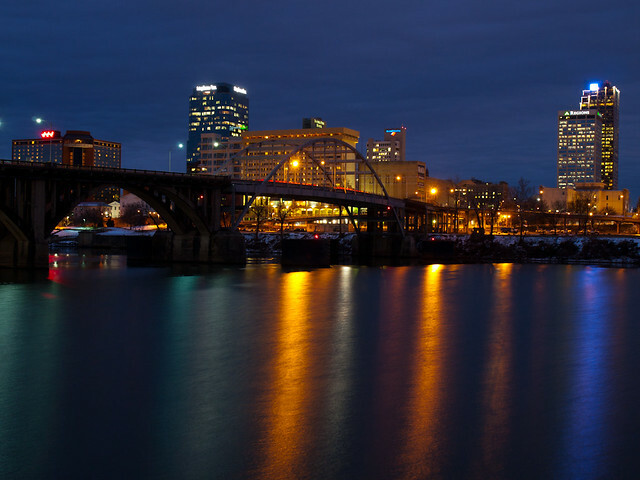 I walked under the Broadway Bridge, and ended up setting the camera up along the river, and waited for it to get dark. When the sky finally turned to dusk, I was distracted by a call on my cellphone. An old friend from college who I hadn't talked to in years decided to randomly call. I tried to take pictures and talk at the same time, which meant that I really wasn't paying much attention to the camera. Luckily, a few of the shots actually turned out. During the call, my friend reported that he had found a coffee table book at a store in Fayetteville that had a few of my pictures in it. I laughed and asked him if he bought a copy of the book so that I could autograph it for him. He laughed back and said "no, of course not..."
After a long conversation, he got bored talking to me and said he had to go. Which was cool, the good light in the sky was gone and I was starting to get cold. I packed up the camera and started walking back to the car. Now one really neat thing about Riverfront Park is the view of the skyline. 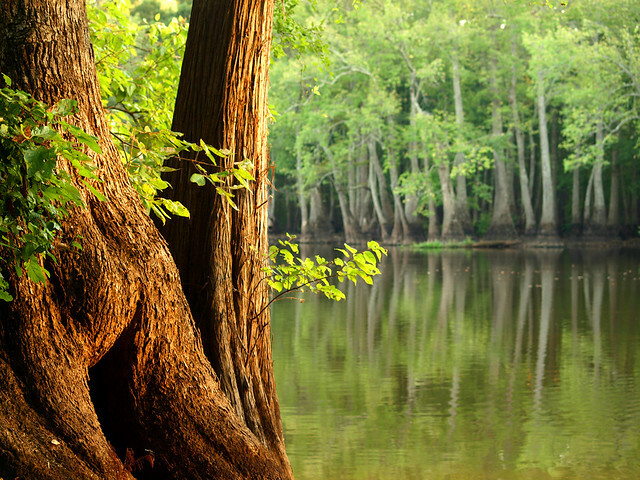 But also there are tons of stately trees growing along the river. They look to be very old, they were probably growing here back when the city first started to develop around them. It's amazing that they have managed to live this long, especially since this has only been a park for a few decades now. I had some time to kill, so I headed back into Little Rock and tried to find something else to get pictures of. I rambled back and forth, and eventually decided to visit a parking deck by Main Street. I hadn't been up there since 2009, so why not? I got the top of the parking deck and found a deep blanket of snow. By this time, most of the snow that we had gotten a few days previous had already melted. The top of this deck must be in shadow during the day, since the snow was still several inches deep. Plus, most of it was fresh. Some people had tried to drive in it, but there weren't that many footprints. I took advantage of the snow and made a little snowman. My hands were cold, so it was a clumsy attempt and it created an awkward little figure. But he has a nice view, here he is enjoying the downtown skyline. On the opposite side of the parking deck is this view, looking down on the old Albert Pike Hotel. 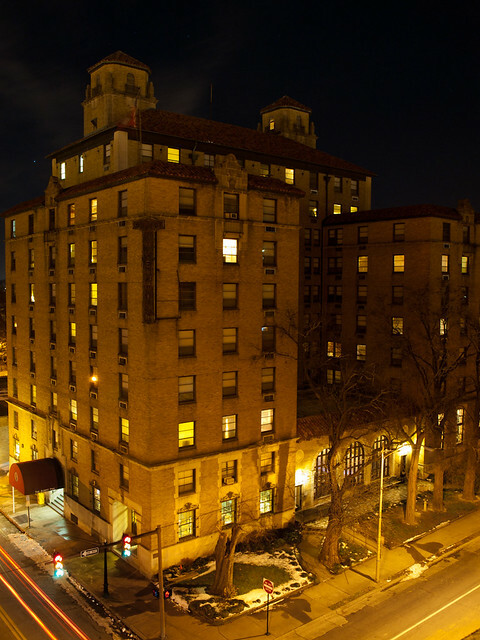 The old hotel was built in 1929, and was in operation until the 1970s. After that it became an old folk's home. I assume it still is, although it looks like there is a popular little bar in the lobby that was attracting a lot of customers. 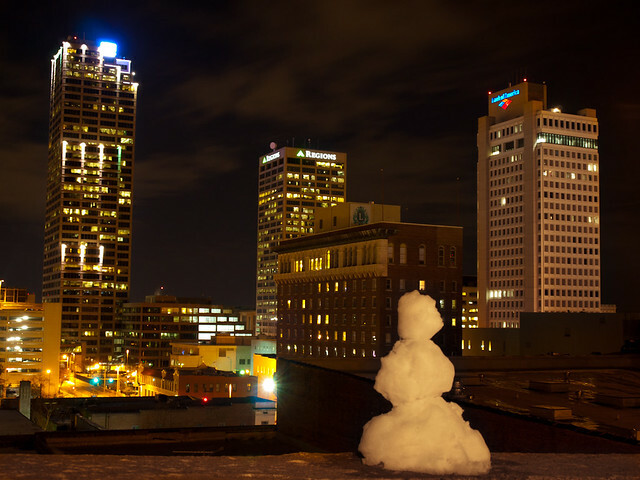 I tend to get a bit skeptical when the weather people predict that there will be snow in Little Rock. For the most part, the snow always seems to dodge the city. Maybe it's the lower elevation in the city, or the trapped heat in the concrete, or whatever. But the mountains will get snow and we'll just get a dusting. So I was sure we wouldn't see much snow when it was predicted to hit last Sunday. And if it did hit, I just knew I would have to wake up and drive to work in whatever mess the winter weather caused. But to my surprise, it did in fact snow. 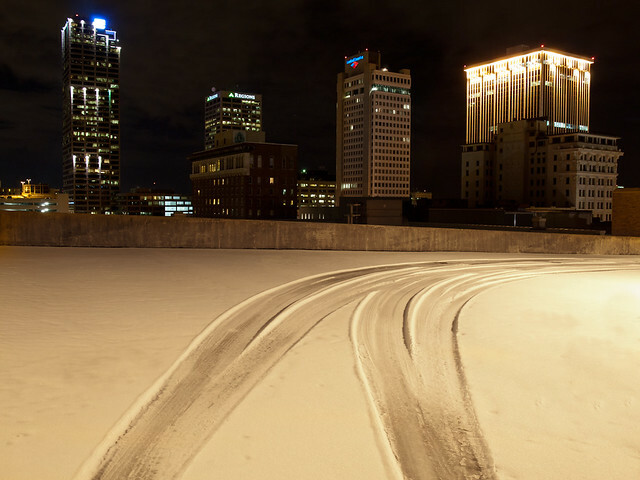 Little Rock got about about 5-6 inches of snow. And it was just snow - no ice or freezing rain. 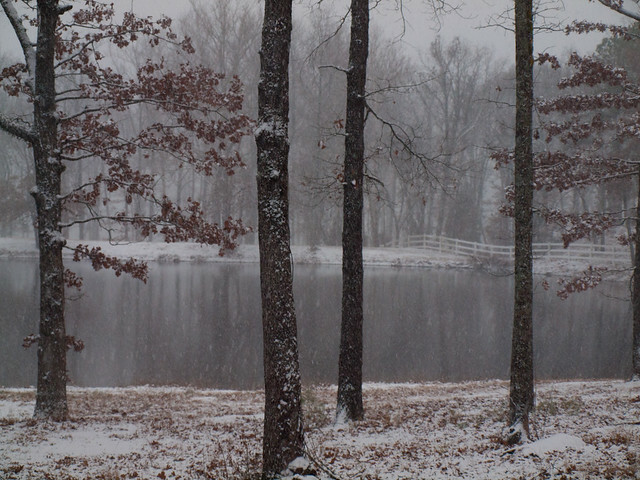 The snow began to fall Sunday afternoon, and quickly it started to accumulate. I was happy, and hoped it would be enough to shut down the office on Monday (it was - and I got a free day off!). When the snow started to stick, I realized that I should maybe get the camera out for a few pictures. 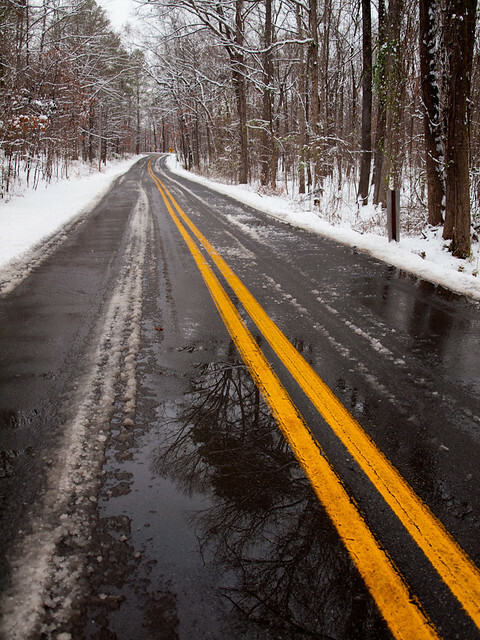 The snow had already begun to stick on the roads, which made me hesitant to head out very far. I ended up visiting a park close to my apartment. I passed by the people rushing to Wal-Mart to get their milk and bread, and instead headed to the Park By The River, in Maumelle. The snow was falling at a good clip, bringing with it that interesting silence that you can only hear during a snowfall. 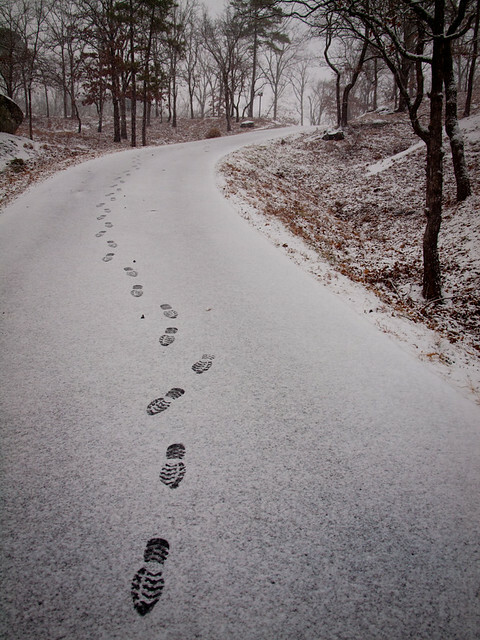 This was taken while walking down the road through the park, looking back up at my footsteps. I don't know what happened there in the middle part of the shot, where my steps take a weird turn for no apparent reason. 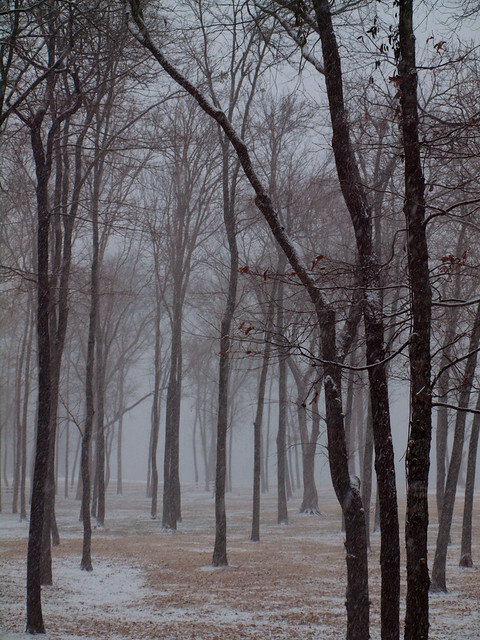 This was taken by the river, where the trees were slowly being covered with snow. I got back in the car and cranked up the heat. My hands were frozen, and my jacket was covered in snow. The main road by my apartment was covered in a slick white sheen of snow, and cars were already sliding around. I headed home, wondering if I would have to go to work in the snow the next day. I woke up at 6:30 and called the inclement weather hotline at the office. And lo and behold, they actually shut the office down! I was amazed, especially since I remember trying to drive to work last year during another rare snow fall. The company I work for is headquartered in Detroit, so I'm sure the corporate office doesn't appreciate one of their branches shutting down for a laughable six inches of snow. I slept in on Monday, and decided to head out into the snow. The roads were slushy, but mostly clear. I grabbed the camera and headed out. My first stop was Burns Park, in North Little Rock. I wasn't sure if that was a good idea. I didn't know if the roads would be clear or not. Luckily, a few other people had the same idea as me, since the roads were drivable. I did slide once on the road through the park. The traction control on the car beeped when this happened, perhaps to let me know that the car was sliding around in the slush. 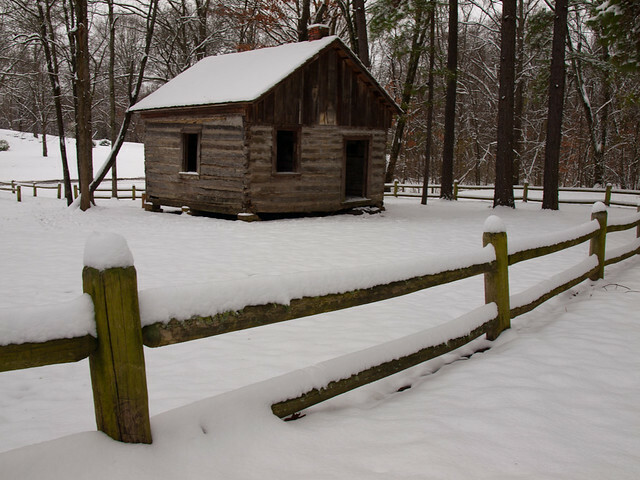 I stopped at the old pioneer cabin at the park. This old home was built before the Civil War, and was the home to the first family that settled on the lands that is now Burns Park. The snow was deep, and thankfully, not many people had trodden through the snow there. 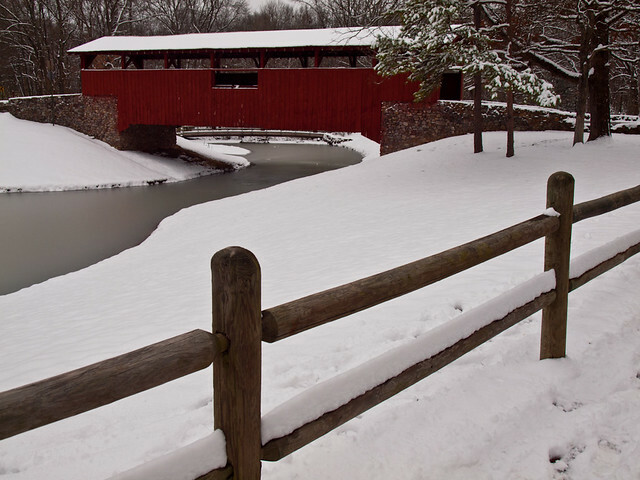 The next stop was the covered bridge in Burns Park. There were a few people out there, including some taking pictures. 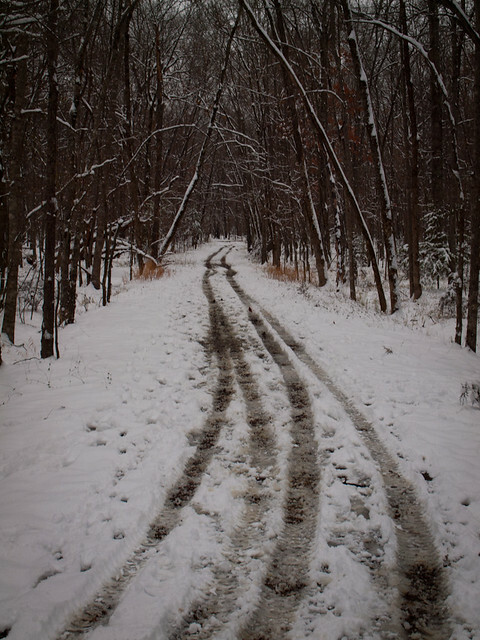 This is a shot of the Boy Scout trail, which runs for several miles through the park. It was getting late, and dusk was starting to settle in. I didn't have much time for another stop, and decided to drive up to Fort Roots. This is a neat spot, it was once a military base, with many neat old buildings that were built in the early 1900s. 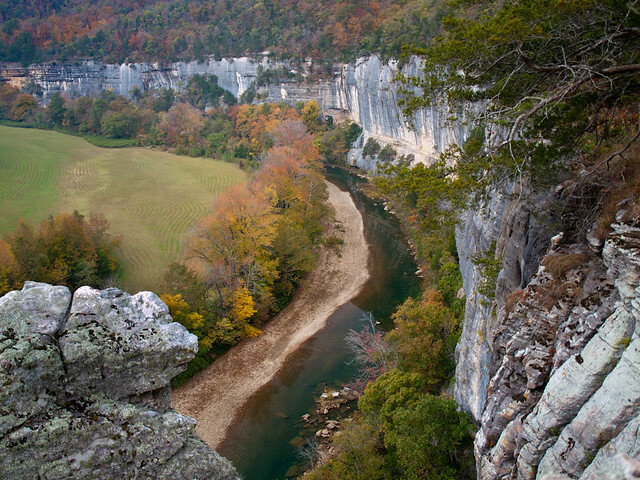 The fort was built on the "big rock," the hill along the river that was the opposite of the "little rock" just downstream. 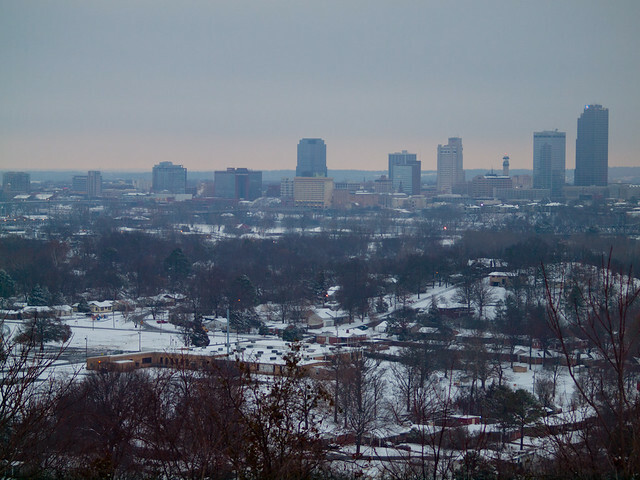 The hill has perhaps the best view of the downtown Little Rock skyline. But you have to be careful up there. Fort Roots became part of the VA Hospital, and the security guards don't like people up there taking pictures (because it's a hospital, for patient privacy or something like that). 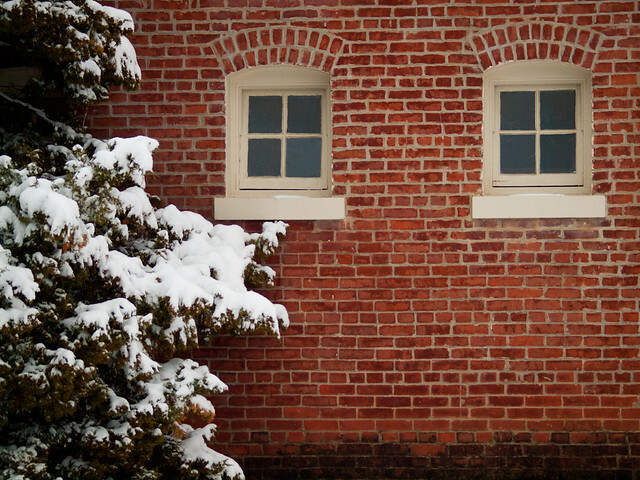 And finally, one last shot of the snow from Fort Roots. There is some really neat architecture up at Fort Roots, since many of the buildings were built at the turn of the 20th century. This old building is right next to the road, actually this was taken from inside the car. As Mattie Ross would say, Holla Bend is located "near Dardanelle, in Yell County, Arkansas." 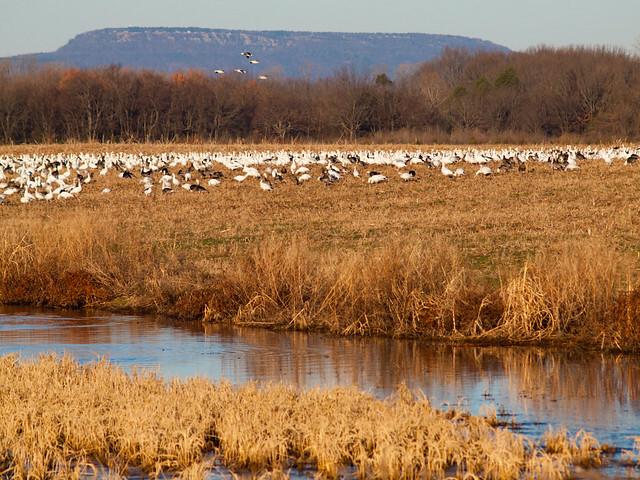 The Holla Bend National Wildlife Refuge is actually located about six miles downriver from Dardanelle. 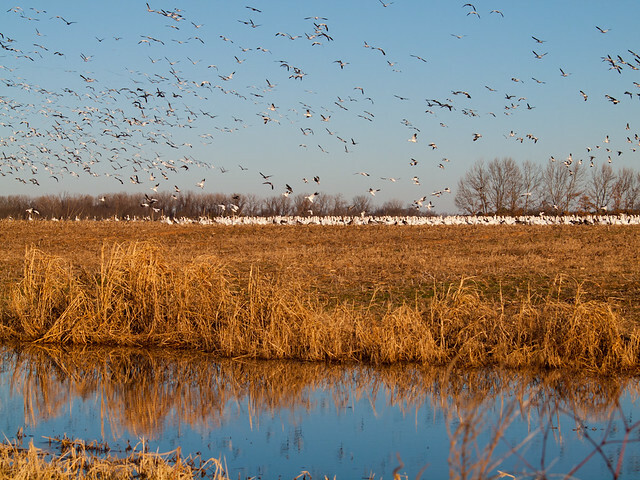 The refuge includes over 7,000 acres of fields, forests and water. The refuge is surrounded on three sides by an oxbow lake, and on one side by the Arkansas River. Over 100,000 birds will make a temporary home here during certain months of the year, and it remains a popular spot for people to get some bird photos. The incredible downside to getting pictures here is the fact that the birds are most active in the early morning hours. Which means, of course, that you have to get there right around sunrise to get to see the birds before they fly off and do whatever it is that birds do. So I wasn't incredibly happy to be awake before dawn and heading out to the refuge. I left Little Rock around 5:30 am with my friend John, and in the darkness we managed to find Matt in Conway and brought him along too. The sun began to rise in the sky to the east, as we made our way towards Dardanelle. We got there just after sunrise, and drove through the refuge looking for the birds. There were numerous deer hanging out alongside the road. I was surprised that we didn't see many other people out there, since this is probably the optimal time to make a visit to the refuge. 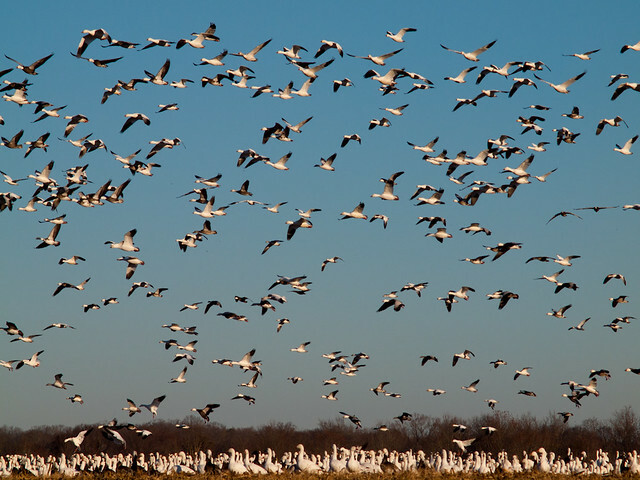 We finally drove by the field that is home to thousands of snow geese. Mount Nebo loomed in the distance, as we approached the field that was covered with so many birds. Luckily, these birds were in much better shape than their winged friends that met an unfortunate end in Beebee on New Year's Eve. It was a cold morning, the temperature was below freezing. 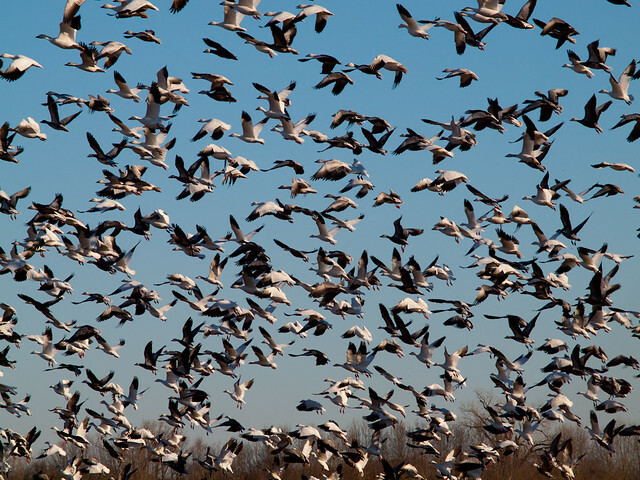 The snow geese were probably still getting warmed up, so to speak, and it took awhile for them to start flying around. But soon, they all took off at once. The noise was incredible. Their honking cries, combined with the rushed beating of wings, was amazing. They took off, soaring high above us in circles (I was amazed to not get hit by any sort of bird droppings during this). The flew around, and eventually moved over to another field and settled down again. We cruised through the refuge, on the lookout for any type of bird. We managed to spot a bald eagle, resting on a tree just off of the side of the road. The eagle flew off, annoyed I'm sure, before I could swing the camera around to get a shot of it. 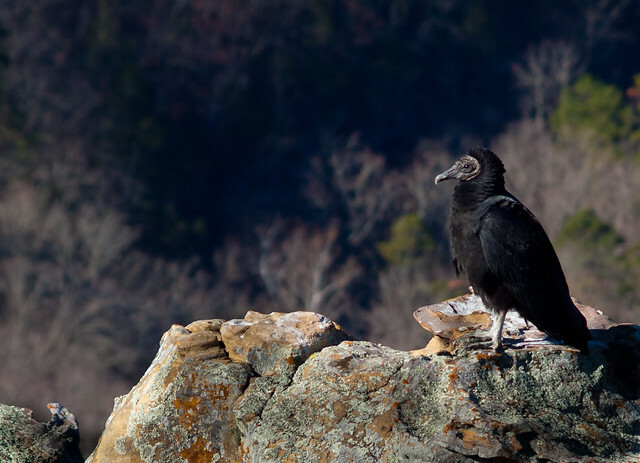 February 13: Near Heber Springs, Arkansas. The weather in 2010 was weird. The summer was the hottest on record, with many days with temps over 100 degrees. But in the winter of 2010, we also saw some really cold weather and several snow storms pass through. I was happy since it actually snowed enough for me to miss a day or so of work. This shot was taken after one of the snow storms. Most of the snow had already melted in Little Rock, but there was still some snow on the ground up on this hill on the way to Heber Springs. The white of the snow matched the white from an early morning fog, effectively casing the scenery in a white void. It was just below freezing outside, and I think some of the fog hit this fence post and froze. March 27: Pizza Hut Park, Frisco, Texas. September 18: Hickson Lake, Dagmar Wildlife Management Area, Arkansas. This is a really neat place that few people ever visit. It's not that far from Little Rock, only about a 50 mile drive to the east. 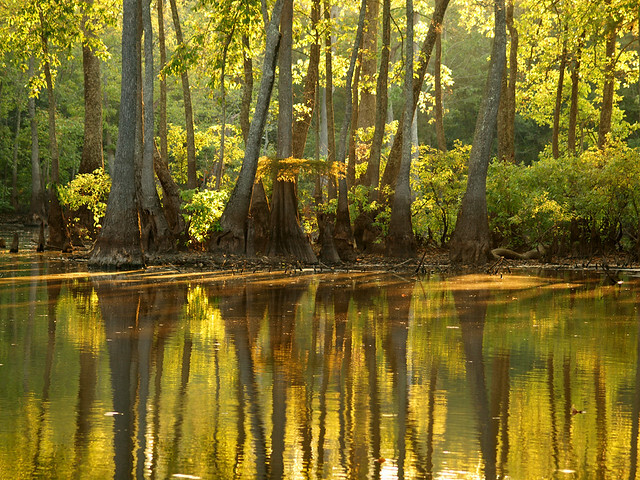 You follow a dirt road that follows a swampy creek for a few miles, passing by tons of cypress trees. 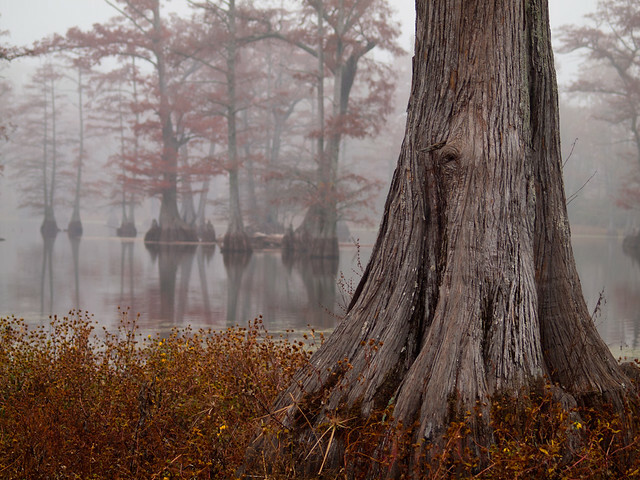 The drive ends at this lake, which is lined with thousands of cypress trees. 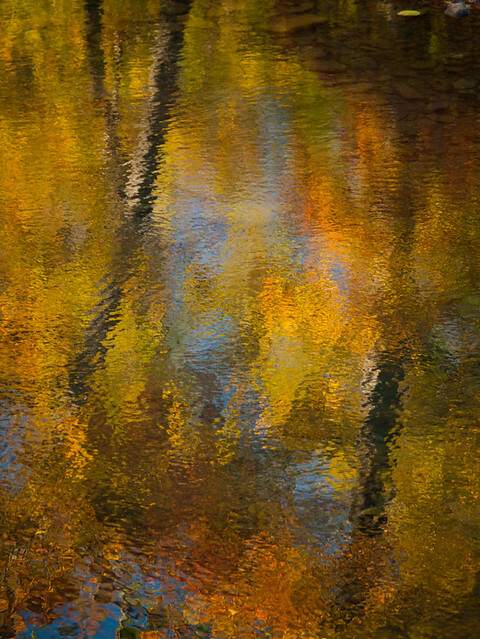 This was taken while late afternoon light was streaming through the trees, casting everything into a golden glow. I took a few days off work in the slim hopes of catching the fall colors at their peak. The fall colors weren't the best this year, but it was worth spending a few days up at the Buffalo River anyways. 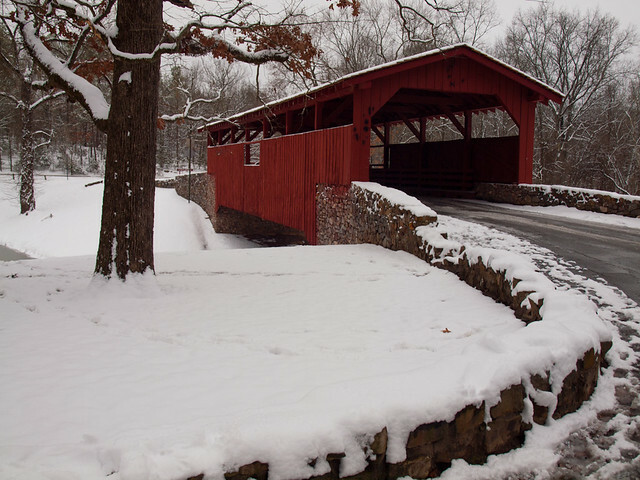 This is one of the prettiest places along the Buffalo, and in the state. November 13: Collins Creek, Greers Ferry Lake, Arkansas. This year was really dry, and most waterfalls in the state turned into a sad trickle by June. Luckily, there is always Collins Creek. 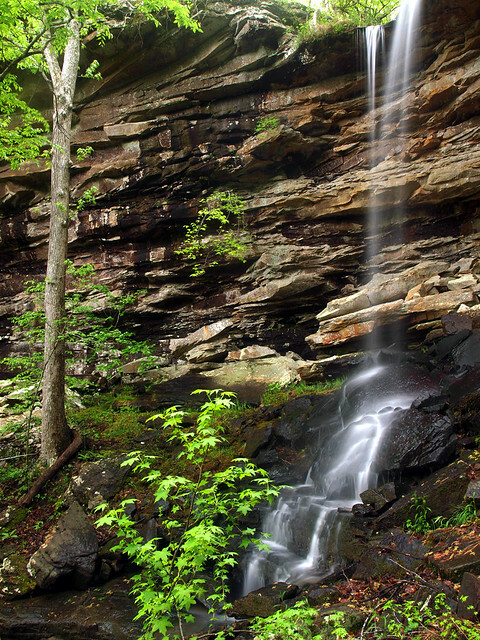 The waterfalls here run year-round, thanks to a pipe from the nearby Greers Ferry Lake. This wonderful spot is always a trustworthy place to turn to for pictures, especially when there is a bit of fall color left lying around. March 20: Union Station, Little Rock, Arkansas. It was pouring down rain when I got this shot of the old train station. I was carefully trying to keep the camera dry with an umbrella, and probably looked a bit odd to anyone driving by. April 24: Lonesome Hollow, Ozark National Forest, Arkansas. 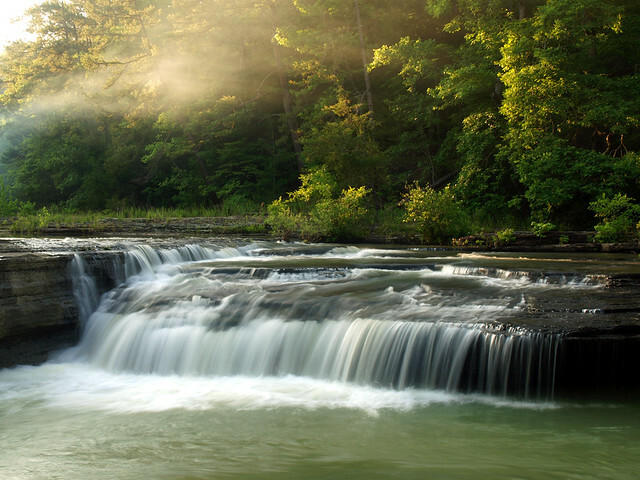 This 47 foot-tall waterfall is rarely visited or seen. Very few people have ever taken pictures of it before, it had actually just been discovered a few weeks before. It is a really neat place, and actually pretty easy to reach too. The coolest part about the falls were the numerous Native American artifacts sitting under a shelter under a nearby bluff. This waterfall won't be lonesome for much longer, it will be included in the next edition of the Tim Ernst waterfall guidebook (which is good, since I can't remember how to get there). Considering the events mentioned in number #24 above, I seriously considered keeping any shot from my trip to Colorado off this list out of spite for that state. But hopefully Silverton is far enough away from the home stadium of the Colorado Rapids to make this shot ok to mention here. This was taken during a trip to Colorado I took with some old friends from college. We stayed in Durango, and decided to make the short drive up to Silverton for the day. Silverton sits high in the mountains, at an elevation of 9,318 feet. There was still a few feet of snow on the ground, which proved very interesting to try to cross. Being from Arkansas, where we only see maybe a few inches of snow, I wasn't used to trying to walk across deep snow. This old steam engine sat by the train station, surrounded by a deep sea of snow. To try walking over there meant traversing the snow pack, which looked solid at first. But every few steps would find a leg quickly disappearing into the snow - which was about knee-deep. My friend, who stayed in the warmth and safety of the car, said she enjoyed watching us Arkies try to negotiate the snow while occasionally falling over. February 6: Bridal Veil Falls, Heber Springs, Arkansas. This is a neat waterfall, which is pretty easy to reach. But it's another waterfall that you don't see too many pictures of, since the falls are on private property. We were of the understanding that it was ok to visit, as long as you didn't trash the area around the falls and the creek. It's really pretty there, with another tall waterfall located nearby. July 17: Boxley Valley, Buffalo National River, Arkansas. This is the old Boxley Mill, built back in 1870. 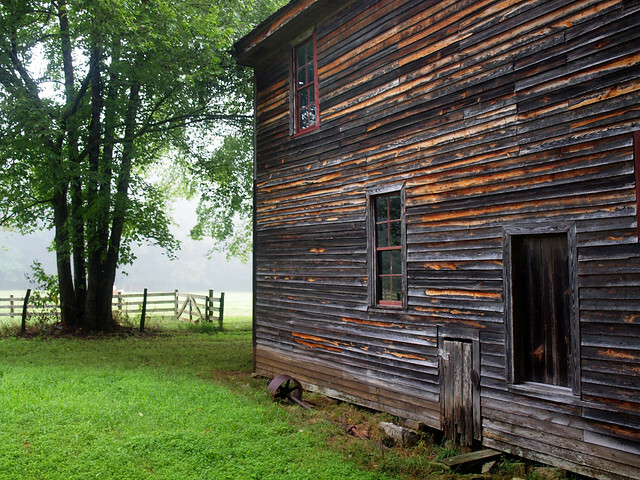 The mill sits in the great Boxley Valley, surrounded by hills and other old barns and homes. I was nervous getting this picture, since I wasn't entirely sure if I was trespassing or not. The mill is supposedly owned by the National Park Service, but there are signs posted around it that say that this is private property. I visited anyways, on a summer morning where a thick fog had settled over the valley. If you're brave enough to visit it, you can peek in the windows and still see the old machinery and equipment used back when this was an operating mill. January 23: The Blue Hole, Ozark National Forest, Arkansas. This is another great spot that not very many people venture to see. There are no signs pointing to the Blue Hole, nor are there many directions on how to get there (but you can get directions HERE). It's a great spot, with several neat waterfalls. There are tons of pine trees around the creeks here, so the ground was covered with lots of pine needles. This was just part of a waterfall that stretched for maybe thirty feet across the entire width of the creek. 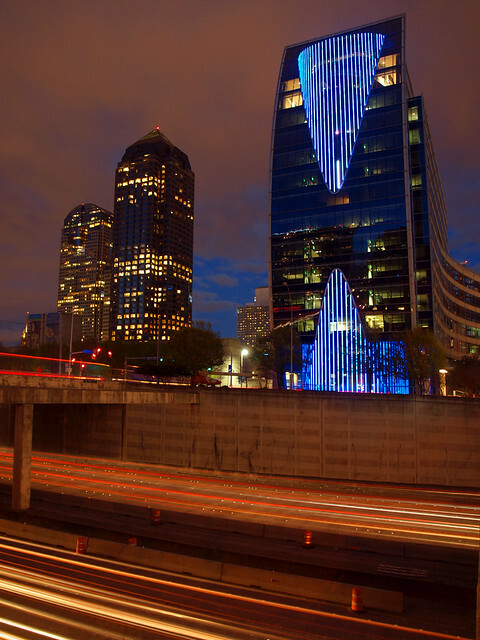 March 27: Downtown Dallas, Texas. This was taken during my trip down to Texas for the FC Dallas season opener. The soccer game was during the day, which left the evening free for a trip down to downtown Dallas for some skyline pictures. I spent several days trying to scout out places online that might make for good pictures, and had a plan to hit a few different spots at dusk. I managed to hit a few places, but my carefully planned shots turned out to just coincide with my being in downtown Dallas on Earth Hour. This is the night every year where cities across the world shut off lights, which managed to turn my night into getting shots of a dimmed Dallas skyline. This was taken before Earth Hour, right around dusk. This shot is looking towards the Arts District. April 24: Big Devil’s Fork of Twin Falls, Richland Creek Wilderness, Ozark National Forest, Arkansas. This is just one half of one of the greatest waterfalls in Arkansas. We got here by hiking about six miles through the rough and difficult terrain of the Richland Creek Wilderness. This is a wonderful hike to take if you want to see some beautiful waterfalls, and to be reminded of just how woefully out-of-shape you are. 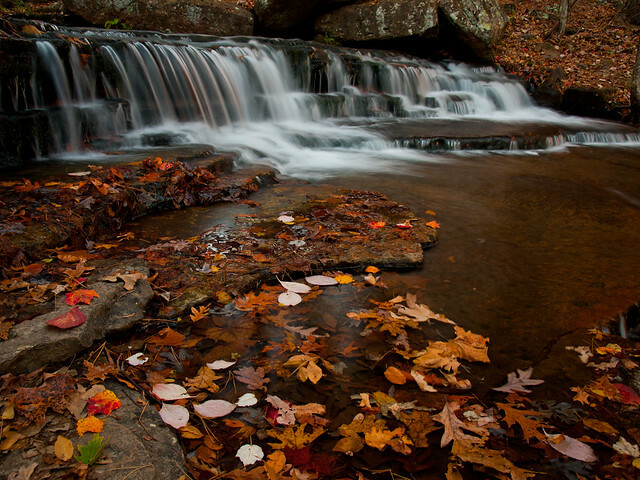 October 30: Lee Creek, Devil’s Den State Park, Arkansas. This was taken during a hike along the Devil's Den trail, which drops down and follows Lee Creek for a bit. The light was harsh this weekend, which made getting any good shots of the fall colors a bit more difficult. But we managed to time our hike so that we were there towards the end of the day, when the late evening sun was streaming through the trees and reflecting nicely on the creek. 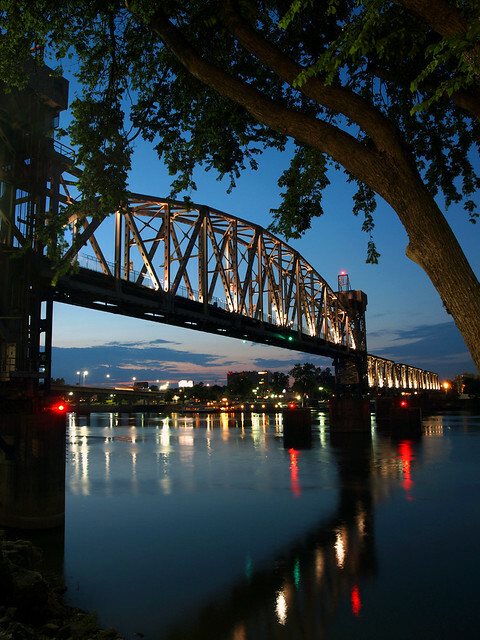 June 7: Junction Bridge, Little Rock, Arkansas. 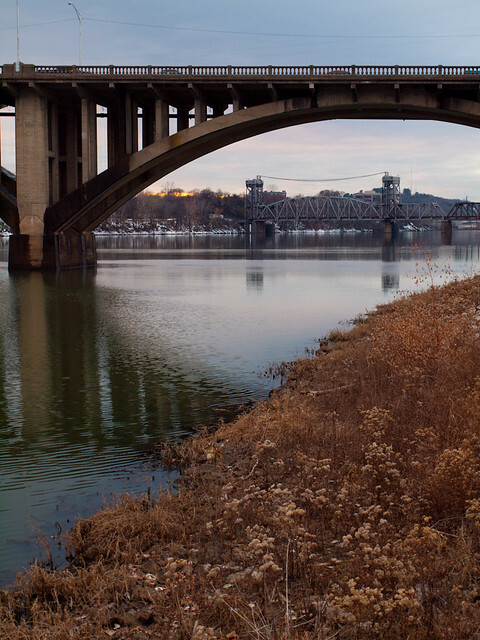 The Junction Bridge was actually built upon the actual "little rock" from which the city of Little Rock took its name. During the construction of the bridge, most of the landmark chunk of rock was blasted away, and unceremoniously dumped into the Arkansas River. Last year, the city of Little Rock tried to dig out and expose as much of the old "little rock" that they could, but didn't really end up finding much. But they did end up building a nice little plaza around the base of the Junction Bridge, which opened up new views of the bridge. This was taken last summer, not too long after the new plaza opened up. 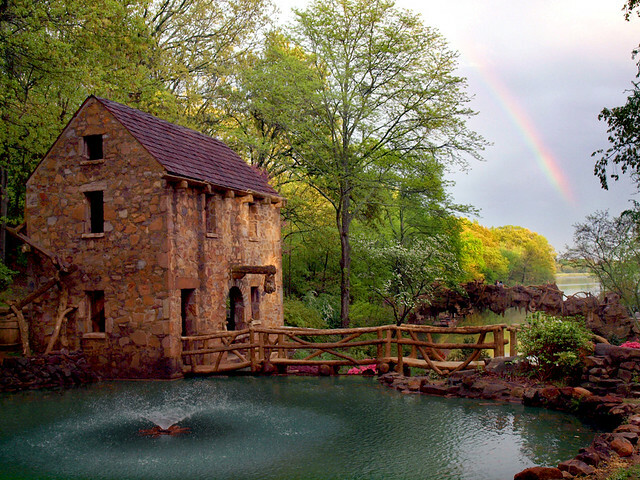 April 7: The Old Mill, North Little Rock, Arkansas. Sometimes it's amazing how you can just luckily find yourself at the right place at the right time. I had gone out to the Old Mill one evening after work. The day had been stormy, and the rain and winds trampled the flowers by the mill. I had been taking pictures and was walking by the mill when I looked up and was amazed to see this rainbow, hanging up in the sky above the mill. I rushed to get a few pictures, but the rainbow faded away a few minutes later. March 10: Downtown North Little Rock, Arkansas. November 21: Rosenbaum Lake, North Little Rock, Arkansas. This is a really neat spot, that thousands of people drive by every single day. I'm one of those commuters, my drive to work takes me right by there. The lake sits just off to the side of I-430, just before the bridge over the Arkansas River. I was somehow awake early enough on a foggy autumn morning, and decided to try to get some pictures of the lake. There isn't any real access point to the lake, so I parked my car along the on-ramp to the freeway and trudged through the thick grass down to the water. I was soon covered in a thick coating of tiny seeds, which clung to my clothes like glue. April 24: Twin Falls, Richland Creek Wilderness, Ozark National Forest, Arkansas. April 13: Hwy. 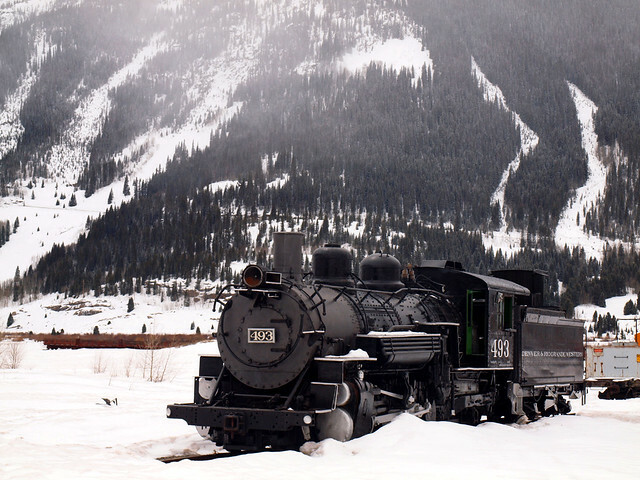 550, between Silverton and Durango, Colorado. Now this shot was taken during one of the more memorable trips during the year. That morning, it had started snowing on us in Durango. It wasn't sticking on the ground, but we were just excited to see snow. How neat! The snow didn't distract us from our plans for the day, which was to drive to the nearby town of Silverton, only 30 or so miles away. We didn't realize, in our ignorance, that the drive to Silverton went over two mountain passes, both over 10,000 feet. So we headed out, enjoying the mountain scenery along the road heading north from Durango. As the road headed up higher in elevation, and the snow started to stick. At first it was a dusting, but then it grew several inches deep. The road from Durango to Silverton is part of the Million Dollar Highway, which it turns out, is one of the more dangerous roads in the country. The highway goes by deep valleys, where the drop off is several hundred feet below you. Oh, and there isn't any guard rails either. The trip to Silverton was mostly my idea, so my friend who was driving was shooting several pointed angry looks in my direction. We stopped at the top of a mountain pass, and debated whether or not it was wise to continue on to Silverton. We decided that we had made it this far, so we might as well continue on since we were nearly there. 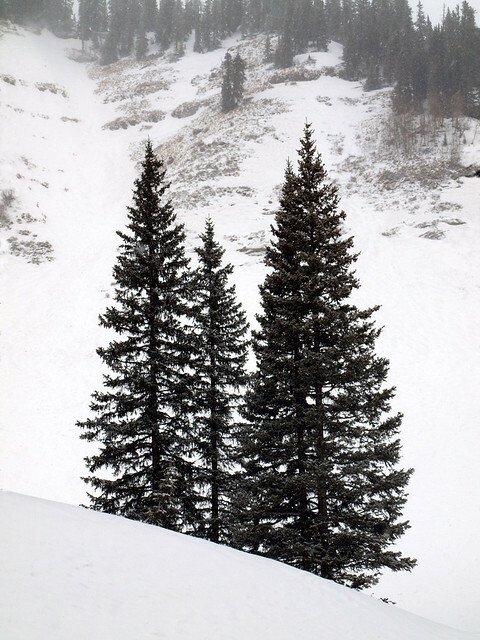 I went out and got this picture from the side of the road, of this view of some trees. We ended up making it down to Silverton successfully, while a heavy snow fell. At the tourist office, we talked to the lady working there, who said that this was just a "typical Spring day in the Rockies." 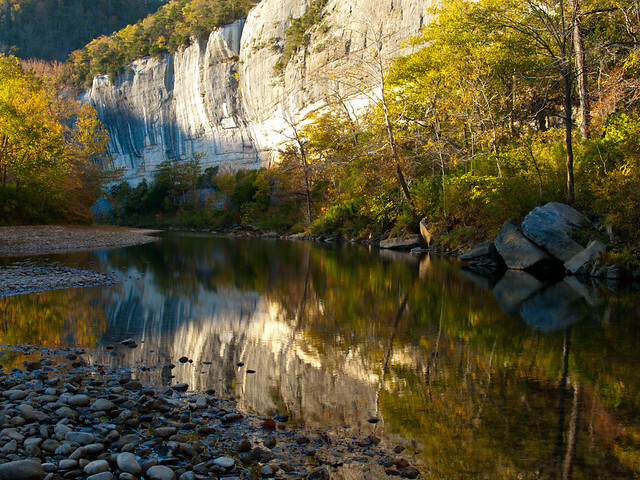 October 23: Roark Bluff, Buffalo National River, Arkansas. 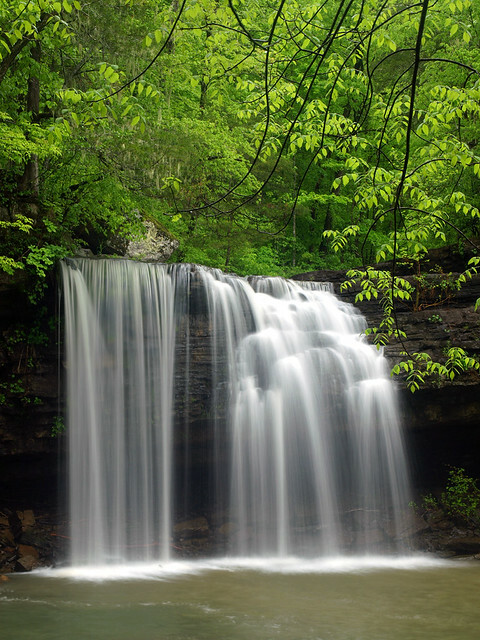 May 23: Haw Creek Falls, Ozark National Forest, Arkansas. I was in the neighborhood, so I decided to drive up and visit this part of the Ozark National Forest. My first stop was to hike to Pam's Grotto Falls, which just had a small amount of water going through. It was about 90 degrees out, and I was a bit tired after making that hike. 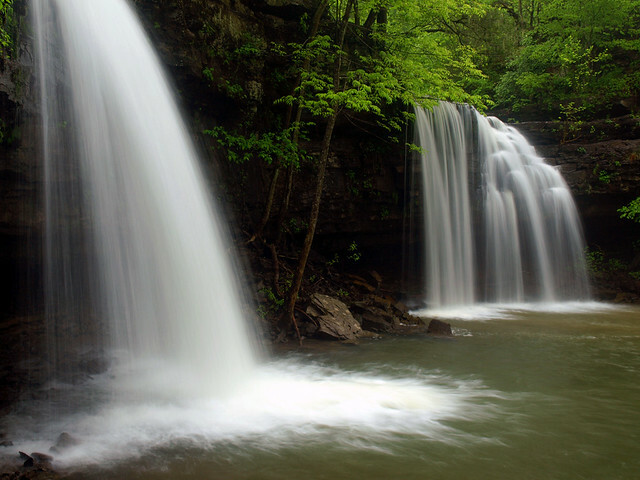 So I debated whether I should make the short and easy drive over to Haw Creek Falls. It was sunny, and I thought the light might be bad for pictures. But I went anyways, and dang am I glad I did. I got to the falls, and saw that there was some decent water going over the falls. Plus, the light from the setting sun was cutting through some smoke from a nearby campfire. This great light lasted for just a few minutes, before the smoke dissipated. 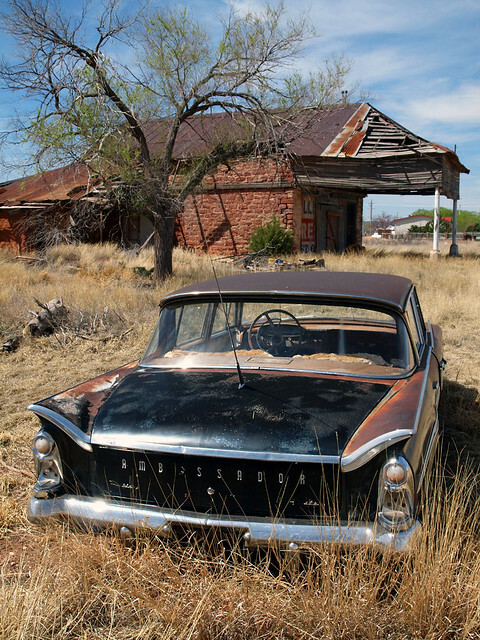 April 11: Along Route 66, Newkirk, New Mexico. If you are going on any sort of road trip, there is no better road to attempt to follow than that of old Route 66. Although the modern interstate has erased much of the old Mother Road, a large remainder of sights from the glory days of the road still exist. If you know where to look for them. This was taken during my road trip out west this Spring. We followed I-40 through Oklahoma, Texas and New Mexico, a path that parallels the old path of Route 66. The old highway is gone in many places, although bits and pieces of it still call out and beckon to any traveler who is wary of the boredom of interstate travel. I had an excellent Route 66 guidebook, which guided us to many of the great sites along the old road. 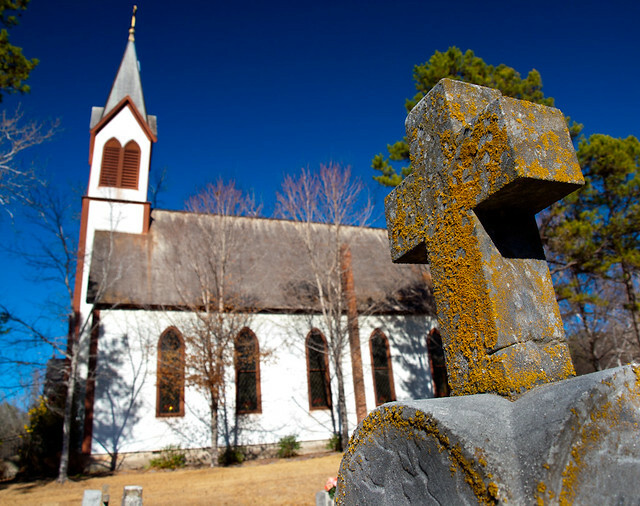 One spot that the guidebook didn't mention was the small town of Newkirk, New Mexico. We stopped there for gas and a bathroom break. The gas station there was the only business open in the old town. Just down the road were the ruins of older gas stations, built in the decades before and left to ruin in the desert sun. While we were stopped, I took the time to explore the old ruins. There was this old station, which had an old car (which I think is an old AMC Ambassador, I'd love to know what year it was made). The car was surrounded by grass, yellowed by the desert sun. These two old relics now just sit to fade and rust as time ever quickly moves away from them. I am grateful to say this picture was chosen to be used for the posters and advertising for the 2011 Small Works On Paper tour. The opening is this Saturday, at the AETN Atrium in Conway! Well thanks for making it this far, and sorry if I ended up being too long-winded. Hopefully 2011 will bring lots of good times, and maybe even a few good pictures.